Some believe that in order to understand a man, look at his actions and not his words. There is truth to that maxim. Still words, too, harbor meaning. A man’s words, if he is allowed to speak, also reveal his character. When he writes those words, they take on infinitely greater meaning than what he utters. The written word is the man’s ultimate truth or evidence of his mistruth. His philosophies unravels between the lines. The philosophies of today’s western world, embedded in the western man’s vocabulary, reveal a deep conflict with the natural world. The western man imagines himself as the antithesis to Nature. He has built a vocabulary to articulate this semantic war. He addresses Nature in the way he calls his enemies to battle. He brands Nature with a name, renders her violent, and with that, feels justified in correcting her “wayward” behavior. In the western world’s book of meanings, rain is depicted as an “overwhelming” quantity. Quantity is nondescript, but overwhelming, though, reveals a perspective. Overwhelming to whom? In the natural world, rain is part of a delicate, and quite necessary, cycle. It is nurturing. The rainfall brings water to humans, animals and plants. It provides a habitat for sea creatures. But westerners believe that rain, as in the form of a deluge or a flood, is gravely severe. Or that water has normal limits, and an abundance of water surpasses what is normal and becomes abnormal. The western man can become inundated with Nature. The western man brands and characterizes other natural events as violent. A cataclysm is “a large-scale and violent event in the natural world.” A tornado is a “destructive vortex of violently rotating winds.” It is “devastating.” Hurricanes are also “violent.” Whirlpools are “turbulent” and hard to escape. Whirlwinds are loud, noisy, disorderly, and tumultuous. In the words of the western world, Nature is rarely, if ever, beautiful. Westerners speak of suffering under Nature, as in “suffering” from sunburn. But the ways they prosper because of Nature are left out of their vocabulary. The fruits of Nature remain unspoken and unwritten. The western man only writes of his conflicts with Nature, of Nature’s “violence” so that he can rightfully combat what he has defined as a threat to his existence. Slashing-and-burning of rainforests, burning of oils, mining of minerals and rocks, poisoning and trashing of waters are only condoned if Nature is violent and therefore should be disrespected with equal wrath. 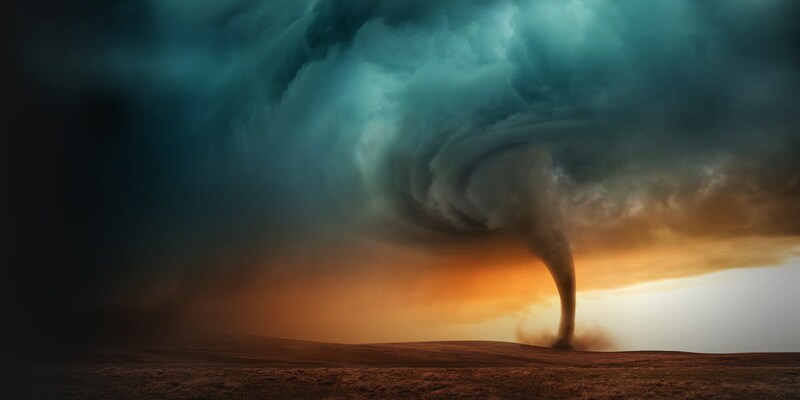 The fascination with and spread of narratives about how many people a “violent” storm or tornado or hurricane killed is not far removed from an agenda to paint Nature as evil so that she can be condemned, corralled, contained, and corrected. Every mention of Nature’s violence is an implicit explanation for western treatment of Nature. The airways can be polluted, the rivers sullied, the species extinguished because Nature, too, exerts harm upon the western man. He brands his retaliation as a two-way street. The street is a road oft traveled. Nature is not an anomaly in this extension of brutality. Today’s western world has a way of branding people with a name, rendering them violent, and with that feeling justified in correcting their “wayward” behavior. African Americans are branded as violent, rapists of white women, criminals, three-fifths of human beings in need of European taming. The battle with words manufactures consent for the physical combat. In this same way, the western world’s enemies are summoned to battle. In no time, it has manufactured a one-sided war, with no true combatant. Semantics is the beginning of a war that starts with propaganda and ends with exploitation. The way today’s western world treats encounters with others via an inciting war is as semantic as it satisfies other spheres of life. The wanton disregard for Nature serves social, psychological, political, economic, philosophical, and ideological interests. The semantic war against Nature is teeming with bottomless greed for materialism, conspicuous consumption, and primitive accumulation. Its end arrives inevitably at an intellectual impasse: between entropy and order, between instability and balance, between a New World and the Perfect World. Only barbarism or civilization can prevail. Nature’s survival depends upon the latter’s triumph. A distinctive observation, Nefetiti. A distinctive characteristic of those who unleash violence on Mother Nature. To destroy something, the person must believe it is of no use unless he destroys it. The west has shown beyond measure, since 1492, that they could care less about the planet. A distinctive piece of writing here, Nefetiti. Thanks for sharing. Deep Sista, a very handy framework for critiquing the current world system and also useful in thrashing out the foundations of a coherent system to replace this sh**stem. Thanks.